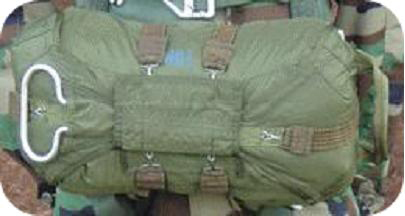 The 24 ft. (7.3m) Diameter Chest Reserve Assembly is an emergency parachute designed to be used in the event of a malfunction of the primary back type parachute. It has a total of 24 gores and there are 4 panels per gore. The suspension lines are made from Type III, 550# nylon cord. 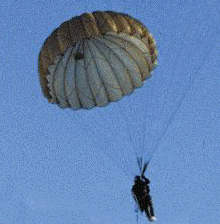 The pilot chute is an umbrella type, which is 40” inches in diameter. The pack is made from nylon duck and contains a pack frame for rigidity. It is fitted with a “two-pin ripcord”, for the spring activated ripcord pocket. The latest U.S. Military style of “Velcro” fasteners are used on the Ripcord Cover panel and Grommet Panel. The 24 ft. Reserve Assembly is intended for use with the 35 ft., T-10B, T-10C or MC1-1B or MC1-1C main assembly. It is not to be used as a primary canopy. In the event that it is needed, it is manually activated through the use of the ripcord. The basic assembly, when packed for service, weighs approximately 12-lbs (5kg). The packed assembly requires less than 27-lbs(5.2kg) manual pull on the ripcord handle to activate the spring loaded pilot chute, thereby deploying the reserve canopy instantaneously. All material colors are the new U.S. Army Foliage Green #504. All 24 Ft. Reserve Parachute Assemblies are manufactured in strict accordance with Personnel Parachute U.S. Military Specifications MIL-DTL-6445, MIL-DTL-7567, and MIL-STD-849, latest revisions.